While diaries are largely associated with teenage hopes and dreams, they are, in fact, a perfect place for people of all ages to keep personal reflections. As our world becomes more technologically advanced, people have moved from writing by hand to typing, whether it be on computers or on their phones and tablets. It is time our diaries have moved from small notebooks on our bedside tables to accessible, intimate members of the online community. By creating a digital diary, you can bring your words into the 21st century with convenience, accessibility and security. So, what exactly is a digital diary? A digital diary is a place where you can record personal events and experiences online. Rather than keeping a traditional diary or notebook to express your thoughts and feelings, you can create a diary and make it available anywhere and everywhere, as long as you have access to the internet. The lock and key you once had on your teenage diary to keep out the unwanted eyes of your siblings and parents have now been replaced by a login and password. Digital diaries offer the mobility you need and the privacy you want. What is Penzu’s Digital Diary App and Software? 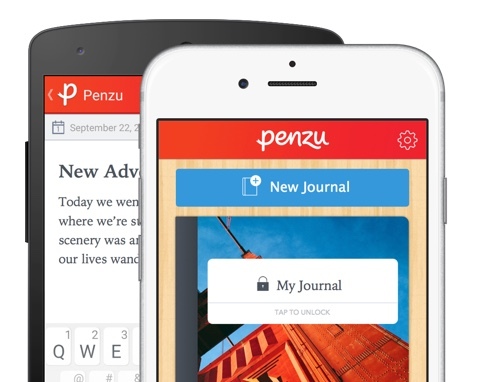 Penzu is a website and mobile app that allows you to create digital diaries for free online. The software allows you to customize and personalize your diary with various backgrounds, fonts and themes. Penzu allows you to be able to login to your diary through any computer or mobile device. With Penzu’s online diary software, you can jot down things from your office computer, as well as your personal one, without missing a beat. With Penzu’s digital diary app, you have the ability to freely express yourself right in the palm of your hand, no matter if you have an iPhone, iPad, Android phone or Android tablet. The website and app work in tandem through the digital journal software, allowing you to access your personal diary seamlessly on both. How do I create an online diary? Creating a journal is as easy as 1,2,3! Create an account with Penzu via the website or download the app and sign-up there. What do I write in my new diary? A diary is a place you can feel safe expressing yourself without judgment. You can write honestly and candidly about any topic you decide, without worrying if someone else will see it. It is a place where your hopes and dreams can flow freely. How much does a Penzu diary cost? Penzu’s diary software and app is free. You can create an account for a digital journal for no cost. The diary app can also be downloaded for free. If you decide you want even more out of your digital diary software, you can download Penzu PRO or Penzu PRO +, which offers additional features including encryption locking for added security and custom fonts and colors for an even more personalized experience. Now you never have to worry about forgetting a feeling, a moment or an adventure again. Start writing your free journal today!